Unified communications (UC) is a hot topic in the industry. Although the provided services may be pretty much the same in different market niches, the way in which such services are implemented can vary significantly. This post is aimed at providing the perspective of a mobile operator. We cannot talk about UC in mobile operators without talking about IMS (IP Multimedia Subsystem). IMS has become a standard across the mobile operators for a number of reasons. Although IMS was designed to integrate SIP devices and obviously 2/3 G mobile phones are not SIP end points, the arrival of the 4G standard (LTE) has introduced a new and interesting actor in the scene, the VoLTE device. VoLTE (Voice over LTE) implementation is the most important challenge the mobile operators are facing nowadays. This type of device is a SIP device, what brings mobile phones into the sphere of native end-points manageable by an IMS. This post does not intend to be a comprehensive description of the UC implementation with IMS, but an introduction to the IMS as a concept and to the role it is playing in UC in the context of mobile operators. IP → IMS is based on end to end IP connections. Multimedia → Different media can be combined, like voice, video, images, text, etc. It means that “circuit switch” (CS) technology has been overcome and that there is not a split between voice calls and data connections any more. All media formats are managed by means of IP connections instead. In my opinion, this is the major advantage we get with the introduction of an IMS. The three functions get separated and independent: access, routing and service. Standardized modularity allows the combination of different vendors and access technologies, and makes network evolution more flexible. IMS platform is access independent. We will see later on how the IMS elements P-CSCF and AG (access gateway) play the role of proxy, to face SIP and other VOIP protocol devices (H323, mgcp) respectively. 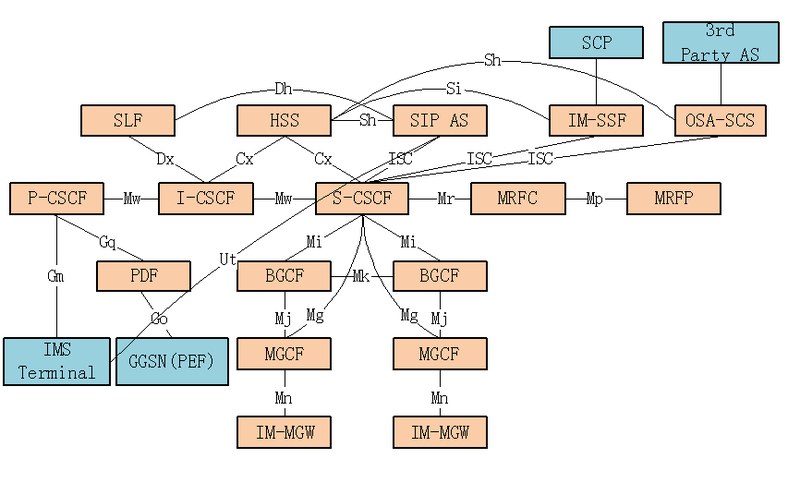 The previous figure shows how the P-CSCF interfaces all SIP connections, independently from the type of connection or device in use. Embedded SIP clients can be used in 3G networks. In this case a data session is established between the mobile network and the P-CSCF. 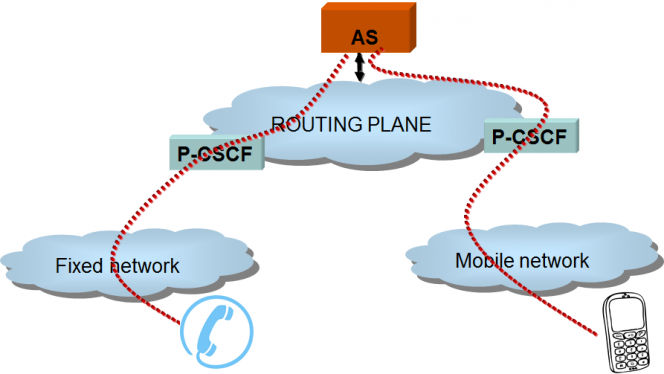 On the other hand LTE devices are able to establish SIP voice calls directly with the P-CSCF. 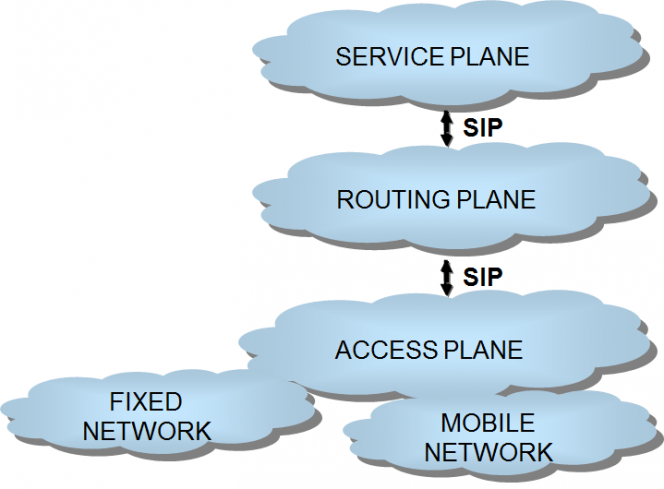 It is important to highlight that VoLTE devices can place SIP calls in a native way, without the need of embedded SIP clients. 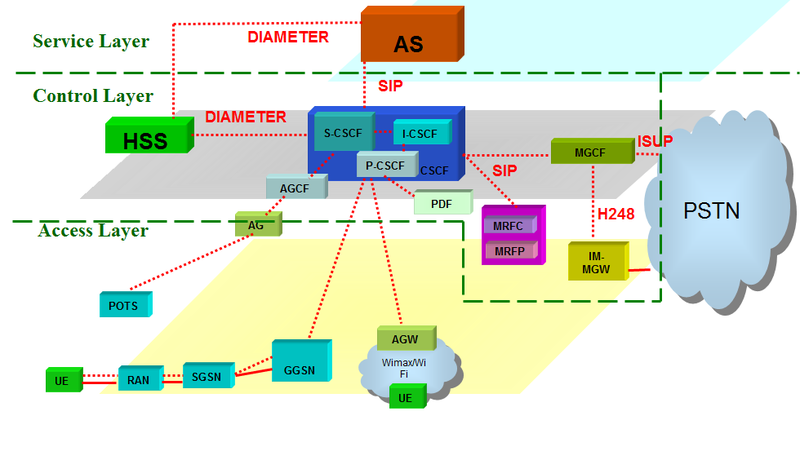 SIP Internet connections can be also established against the P-CSCF. So, voice calls (VoLTE) and voice calls encapsulated into data connections can be managed by the IMS. On the other hand, the AGCF (Access Gateway Control Function) can manage other VOIP protocols, translating them into SIP in the boundary of the IMS space. 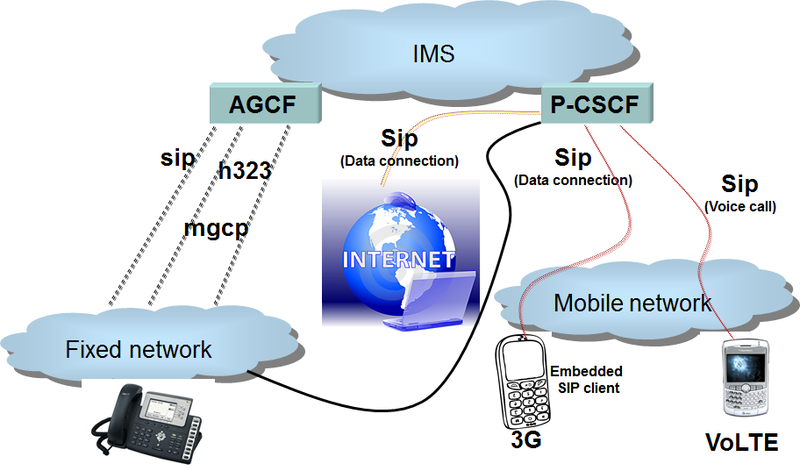 Of course, SIP phones can also be managed by the IMS by means of the P-CSCF. 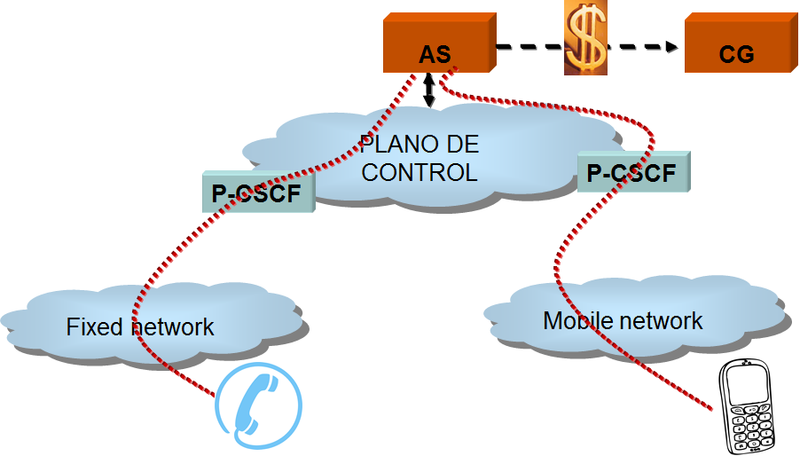 The previous figure shows the way in which both, fixed and mobile devices, can use exactly the same services, provided by the AS (Application Server) in the service plane. Therefore, the user experience is the same, independently from the user device. It comes evident from the figure 4 that once the same Application Server provides the services to fixed and mobile devices, the CG (charging gateway) can get convergent billing data for fixed and mobile networks. IMS architecture is anything but simple. The already commented characteristics of function separation and modularity leads to a complex architecture that can be seen in the next two figures. The IMS space is considered to be a trusted area, since the P-CSCF applies a series of security procedures towards the access plane. The QoS policy function is applied when a Policy server is deployed, in order to apply QoS policies in the access network. The P-CSCF communicates with the Policy server to orchestrate the QoS policies. I-CSCF accepts requests for registration and terminating calls, and it interrogates the HSS (Home Subscriber Server) to retrieve the corresponding S-CSCF address. The S-CSCF is in charge of registering a user and triggering the services for such user by routing the incoming requests to the Application Server. The HSS is the data base where all the information related to a subscriber is provisioned. It is the equivalent to the HLR for mobile networks. The MGCF is in charge of interworking with PSTN by exchanging ISUP messages. It is also in charge of managing the allocation of ports in the Media GW to support the media interworking between the IMS and PSTN. This control of the Media GW is based on H248 protocol. The media gateway offers TDM connectivity against PSTN and IP connectivity for RTP flows with the IMS devices. So, in the context of IMS, while the UC services are applied by the Application Server, the routing and access management functions are done by the IMS. Unified communication services can be implemented in a number of ways. The major distinction can be done depending on whether the service is deployed locally within the end user premises, or it is hosted in a central platform serving a lot of local customer offices. In the first model a series of local servers (presence, telephony, instant messaging, etc.) are deployed in order to provide the service to a single office or to a series of premises within the same company. In the second model, an Operator company hosts the service for a big number of customer sites. The latter is an Operator model that can be deployed in several ways. The traditional way to implement UC services by an Operator company is by using a compact softswitch in which routing, provisioning and service planes are put together into a compact platform. CS2K by Gendband and Broadsoft Application Server (stand-alone mode) would match with that model. As we have seen in the previous sections, IMS is the new way in which mobile Operators are deploying their services nowadays. In this model, access, routing and service planes have been separated. Now, the service is only associated with the application server placed in the service layer. The previous cited vendors, Gendband and Broadsoft, have IMS compliant implementations. In both cases the service engine (application server) is used connected directly to an IMS. So, routing and other capabilities in the stand-alone product are not use in this implementation. Of course, a series of requirements like offering a standard isc interface to the S-CSCF are required in an Application server to be compatible with any IMS vendor. As summary, I would say that the understanding of how mobile operators are deploying UC services nowadays, requires the understanding of IMS technology, what is not an easy challenge. IMS modularity brings flexibility but it leads to a higher level of complexity in the way in which the different modules interact among them.